Definition at line 19 of file QweakSimUserInformation.hh. Definition at line 5 of file QweakSimUserInformation.cc. Definition at line 11 of file QweakSimUserInformation.cc. Definition at line 417 of file QweakSimUserInformation.hh. Definition at line 433 of file QweakSimUserInformation.hh. Definition at line 434 of file QweakSimUserInformation.hh. Definition at line 431 of file QweakSimUserInformation.hh. Definition at line 432 of file QweakSimUserInformation.hh. Definition at line 435 of file QweakSimUserInformation.hh. Definition at line 436 of file QweakSimUserInformation.hh. Definition at line 73 of file QweakSimUserInformation.hh. References dEBremIn, dEBremOut, dEIonIn, dEIonOut, dEMscIn, and dEMscOut. Referenced by QweakSimEventAction::EndOfEventAction(), and Initialize(). Definition at line 326 of file QweakSimUserInformation.hh. Definition at line 290 of file QweakSimUserInformation.hh. Referenced by QweakSimEventAction::CalculateKinematicVariables(), QweakSimEPEvent::Delta_Resonance(), QweakSimEventAction::EndOfEventAction(), QweakSimEPEvent::GetBeamEnergy(), and QweakSimEPEvent::Radiative_Cross_Section_Lookup(). Definition at line 87 of file QweakSimUserInformation.hh. Definition at line 88 of file QweakSimUserInformation.hh. Definition at line 89 of file QweakSimUserInformation.hh. Definition at line 418 of file QweakSimUserInformation.hh. Definition at line 383 of file QweakSimUserInformation.hh. Definition at line 421 of file QweakSimUserInformation.hh. Definition at line 409 of file QweakSimUserInformation.hh. Definition at line 471 of file QweakSimUserInformation.cc. Definition at line 408 of file QweakSimUserInformation.hh. Definition at line 463 of file QweakSimUserInformation.cc. Definition at line 454 of file QweakSimUserInformation.cc. Definition at line 445 of file QweakSimUserInformation.cc. Definition at line 410 of file QweakSimUserInformation.hh. Definition at line 411 of file QweakSimUserInformation.hh. Definition at line 320 of file QweakSimUserInformation.hh. Definition at line 336 of file QweakSimUserInformation.hh. Definition at line 339 of file QweakSimUserInformation.hh. Definition at line 333 of file QweakSimUserInformation.hh. Definition at line 351 of file QweakSimUserInformation.hh. Definition at line 364 of file QweakSimUserInformation.hh. Definition at line 345 of file QweakSimUserInformation.hh. Definition at line 358 of file QweakSimUserInformation.hh. Definition at line 368 of file QweakSimUserInformation.hh. Definition at line 348 of file QweakSimUserInformation.hh. Definition at line 361 of file QweakSimUserInformation.hh. Definition at line 342 of file QweakSimUserInformation.hh. Definition at line 355 of file QweakSimUserInformation.hh. Definition at line 323 of file QweakSimUserInformation.hh. Definition at line 414 of file QweakSimUserInformation.hh. Definition at line 415 of file QweakSimUserInformation.hh. Definition at line 441 of file QweakSimUserInformation.hh. Definition at line 442 of file QweakSimUserInformation.hh. Definition at line 443 of file QweakSimUserInformation.hh. Referenced by QweakSimEventAction::EndOfEventAction(), and PrintELoss(). Definition at line 438 of file QweakSimUserInformation.hh. Definition at line 439 of file QweakSimUserInformation.hh. Definition at line 440 of file QweakSimUserInformation.hh. Definition at line 444 of file QweakSimUserInformation.hh. Definition at line 445 of file QweakSimUserInformation.hh. Definition at line 446 of file QweakSimUserInformation.hh. Definition at line 449 of file QweakSimUserInformation.hh. Definition at line 447 of file QweakSimUserInformation.hh. References dEBremIn, dEIonIn, and dEMscIn. Definition at line 448 of file QweakSimUserInformation.hh. References dEBremOut, dEIonOut, and dEMscOut. Definition at line 397 of file QweakSimUserInformation.hh. Definition at line 307 of file QweakSimUserInformation.hh. Definition at line 304 of file QweakSimUserInformation.hh. Definition at line 313 of file QweakSimUserInformation.hh. Definition at line 310 of file QweakSimUserInformation.hh. Definition at line 204 of file QweakSimUserInformation.hh. Definition at line 293 of file QweakSimUserInformation.hh. Definition at line 273 of file QweakSimUserInformation.hh. Referenced by QweakSimEventAction::EndOfEventAction(), and QweakSimEPEvent::GetEPrime_Max(). Definition at line 270 of file QweakSimUserInformation.hh. Referenced by QweakSimEventAction::EndOfEventAction(), and QweakSimEPEvent::GetEPrime_Min(). Definition at line 216 of file QweakSimUserInformation.hh. Definition at line 389 of file QweakSimUserInformation.hh. Definition at line 400 of file QweakSimUserInformation.hh. Definition at line 296 of file QweakSimUserInformation.hh. Referenced by QweakSimEventAction::CalculateRate(), QweakSimEventAction::EndOfEventAction(), and QweakSimEPEvent::GetLuminosity(). Definition at line 93 of file QweakSimUserInformation.hh. Definition at line 91 of file QweakSimUserInformation.hh. Definition at line 92 of file QweakSimUserInformation.hh. Definition at line 100 of file QweakSimUserInformation.hh. Referenced by QweakSimEventAction::CalculateRate(), QweakSimEventAction::EndOfEventAction(), QweakSimAnalysis::GetNumberOfEventToBeProcessed(), and QweakSimEPEvent::~QweakSimEPEvent(). Definition at line 369 of file QweakSimUserInformation.cc. Definition at line 376 of file QweakSimUserInformation.cc. Definition at line 260 of file QweakSimUserInformation.hh. Definition at line 257 of file QweakSimUserInformation.hh. Definition at line 266 of file QweakSimUserInformation.hh. Definition at line 263 of file QweakSimUserInformation.hh. Definition at line 250 of file QweakSimUserInformation.hh. Definition at line 231 of file QweakSimUserInformation.hh. Definition at line 234 of file QweakSimUserInformation.hh. Definition at line 237 of file QweakSimUserInformation.hh. Definition at line 243 of file QweakSimUserInformation.hh. Definition at line 222 of file QweakSimUserInformation.hh. Definition at line 225 of file QweakSimUserInformation.hh. Definition at line 228 of file QweakSimUserInformation.hh. Referenced by QweakSimEventAction::EndOfEventAction(), QweakSimEPEvent::Radiative_Cross_Section_Lookup(), and QweakSimSteppingAction::UserSteppingAction(). Definition at line 240 of file QweakSimUserInformation.hh. Referenced by QweakSimEventAction::CalculateKinematicVariables(), and QweakSimEventAction::EndOfEventAction(). Definition at line 253 of file QweakSimUserInformation.hh. Definition at line 378 of file QweakSimUserInformation.hh. Definition at line 299 of file QweakSimUserInformation.hh. Referenced by QweakSimEventAction::CalculateRate(), QweakSimEventAction::EndOfEventAction(), and QweakSimEPEvent::GetPhaseSpace(). Definition at line 285 of file QweakSimUserInformation.hh. Referenced by QweakSimEventAction::EndOfEventAction(), and QweakSimEPEvent::GetPhiAngle_Max(). Definition at line 282 of file QweakSimUserInformation.hh. Referenced by QweakSimEventAction::EndOfEventAction(), and QweakSimEPEvent::GetPhiAngle_Min(). Definition at line 247 of file QweakSimUserInformation.hh. Definition at line 329 of file QweakSimUserInformation.hh. Referenced by QweakSimEventAction::EndOfEventAction(), and QweakSimSteppingAction::UserSteppingAction(). Definition at line 317 of file QweakSimUserInformation.hh. Definition at line 372 of file QweakSimUserInformation.hh. Definition at line 375 of file QweakSimUserInformation.hh. 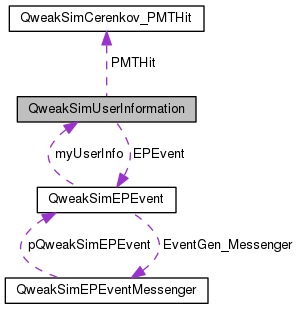 Referenced by QweakSimEventAction::CalculateKinematicVariables(), QweakSimEventAction::EndOfEventAction(), and QweakSimEPEvent::SuperElasticCheck(). Definition at line 391 of file QweakSimUserInformation.hh. Definition at line 394 of file QweakSimUserInformation.hh. Definition at line 279 of file QweakSimUserInformation.hh. Referenced by QweakSimEventAction::EndOfEventAction(), and QweakSimEPEvent::GetThetaAngle_Max(). Definition at line 276 of file QweakSimUserInformation.hh. Referenced by QweakSimEventAction::EndOfEventAction(), and QweakSimEPEvent::GetThetaAngle_Min(). Definition at line 213 of file QweakSimUserInformation.hh. Definition at line 382 of file QweakSimUserInformation.hh. Definition at line 45 of file QweakSimUserInformation.cc. References Asymmetry, CerEngDep, cerenkovEventExitPos, cerenkovOpticalPhotonCount, CerenkovPhotonEnergy, cerenkovSecondaryElectronCount, cerenkovSecondaryPartCharge, cerenkovSecondaryPartEng, cerenkovSecondaryParticleCount, cerenkovSecondaryPartMom, cerenkovSecondaryPartOrig, cerenkovSecondaryPhotonCount, cerenkovSecondaryPositronCount, ClearELoss(), CrossSection, CrossSectionBornInelastic, CrossSectionBornQE, CrossSectionBornTotal, CrossSectionRadDIS, CrossSectionRadDISIntOnly, CrossSectionRadElastic, CrossSectionRadElasticIntOnly, CrossSectionRadElasticPeak, CrossSectionRadQE, CrossSectionRadQEIntOnly, CrossSectionRadTotal, CrossSectionRadTotalIntOnly, CrossSectionWeight, EffectiveKinematicNu, EffectiveKinematicQ2, EffectiveKinematicW, EffectiveKinematicX, fBeamEnergy, fEPrime_Max, fEPrime_Min, fLuminosity, fNormMomentumX, fNormMomentumY, fPhaseSpace, fPhiAngle_Max, fPhiAngle_Min, fPositionX, fPositionY, fThetaAngle_Max, fThetaAngle_Min, GlobalTime, leftPMTHitValid, OriginVertexKinematicNu, OriginVertexKinematicQ2, OriginVertexKinematicW, OriginVertexKinematicX, OriginVertexKineticEnergy, OriginVertexMomentumDirectionX, OriginVertexMomentumDirectionY, OriginVertexMomentumDirectionZ, OriginVertexPhiAngle, OriginVertexPositionX, OriginVertexPositionY, OriginVertexPositionZ, OriginVertexThetaAngle, OriginVertexTotalEnergy, PDGcode, PMTQE_XP4572, PMTQED753WKBS20, PrimaryEventNumber, PrimaryQ2, ReactionRegion, ReactionType, rightPMTHitValid, SetEdgeEventDetected(), StoreStepVolumeName(), TargetCenterPositionZ, TargetDSDummyPositionOffsetZ, TargetLength, TargetUSDummyPositionOffsetZ, and TrackID. 60 // The average US and average DS positions are used. 78 // J. Beringer et al. (Particle Data Group), Phys. Rev. D86, 010001 (2012). Definition at line 15 of file QweakSimUserInformation.cc. References fNormMomentumX, fNormMomentumY, fPositionX, fPositionY, OriginVertexKineticEnergy, OriginVertexMomentumDirectionX, OriginVertexMomentumDirectionY, OriginVertexMomentumDirectionZ, OriginVertexPhiAngle, OriginVertexPositionX, OriginVertexPositionY, OriginVertexPositionZ, OriginVertexThetaAngle, OriginVertexTotalEnergy, PrimaryEventNumber, ReactionType, TargetCenterPositionZ, and TargetLength. Definition at line 34 of file QweakSimUserInformation.cc. References dEBremIn, dEBremOut, dEIonIn, dEIonOut, dEMscIn, dEMscOut, GetdEBremTot(), GetdEIonTot(), GetdEMscTot(), GetdETot(), GetdETotIn(), and GetdETotOut(). Definition at line 479 of file QweakSimUserInformation.cc. References cerenkovOpticalPhotonCount, CerenkovPhotonEnergy, cerenkovSecondaryElectronCount, cerenkovSecondaryPartCharge, cerenkovSecondaryPartEng, cerenkovSecondaryParticleCount, cerenkovSecondaryPartMom, cerenkovSecondaryPartOrig, cerenkovSecondaryPhotonCount, and cerenkovSecondaryPositronCount. Definition at line 83 of file QweakSimUserInformation.hh. Definition at line 84 of file QweakSimUserInformation.hh. Definition at line 289 of file QweakSimUserInformation.hh. Definition at line 80 of file QweakSimUserInformation.hh. Definition at line 81 of file QweakSimUserInformation.hh. Definition at line 82 of file QweakSimUserInformation.hh. Definition at line 413 of file QweakSimUserInformation.hh. Definition at line 396 of file QweakSimUserInformation.hh. Definition at line 203 of file QweakSimUserInformation.hh. Definition at line 292 of file QweakSimUserInformation.hh. Definition at line 272 of file QweakSimUserInformation.hh. Definition at line 269 of file QweakSimUserInformation.hh. Definition at line 388 of file QweakSimUserInformation.hh. Definition at line 295 of file QweakSimUserInformation.hh. Definition at line 97 of file QweakSimUserInformation.hh. Definition at line 298 of file QweakSimUserInformation.hh. Definition at line 284 of file QweakSimUserInformation.hh. Definition at line 281 of file QweakSimUserInformation.hh. Definition at line 390 of file QweakSimUserInformation.hh. Definition at line 278 of file QweakSimUserInformation.hh. Definition at line 275 of file QweakSimUserInformation.hh. Definition at line 325 of file QweakSimUserInformation.hh. Definition at line 420 of file QweakSimUserInformation.hh. Definition at line 384 of file QweakSimUserInformation.cc. References cerenkovSecondaryElectronCount, cerenkovSecondaryPartCharge, cerenkovSecondaryPartEng, cerenkovSecondaryParticleCount, cerenkovSecondaryPartMom, cerenkovSecondaryPartOrig, cerenkovSecondaryPhotonCount, and cerenkovSecondaryPositronCount. Definition at line 319 of file QweakSimUserInformation.hh. Definition at line 335 of file QweakSimUserInformation.hh. Definition at line 338 of file QweakSimUserInformation.hh. Definition at line 332 of file QweakSimUserInformation.hh. Definition at line 350 of file QweakSimUserInformation.hh. Definition at line 363 of file QweakSimUserInformation.hh. Definition at line 344 of file QweakSimUserInformation.hh. Definition at line 357 of file QweakSimUserInformation.hh. Definition at line 367 of file QweakSimUserInformation.hh. Definition at line 347 of file QweakSimUserInformation.hh. Definition at line 360 of file QweakSimUserInformation.hh. Definition at line 341 of file QweakSimUserInformation.hh. Definition at line 354 of file QweakSimUserInformation.hh. Definition at line 322 of file QweakSimUserInformation.hh. Definition at line 426 of file QweakSimUserInformation.hh. Definition at line 427 of file QweakSimUserInformation.hh. Definition at line 424 of file QweakSimUserInformation.hh. Definition at line 425 of file QweakSimUserInformation.hh. Definition at line 428 of file QweakSimUserInformation.hh. Definition at line 429 of file QweakSimUserInformation.hh. Definition at line 306 of file QweakSimUserInformation.hh. Definition at line 303 of file QweakSimUserInformation.hh. Definition at line 312 of file QweakSimUserInformation.hh. Definition at line 309 of file QweakSimUserInformation.hh. Definition at line 215 of file QweakSimUserInformation.hh. Definition at line 399 of file QweakSimUserInformation.hh. Definition at line 259 of file QweakSimUserInformation.hh. Definition at line 256 of file QweakSimUserInformation.hh. Definition at line 265 of file QweakSimUserInformation.hh. Definition at line 262 of file QweakSimUserInformation.hh. Definition at line 249 of file QweakSimUserInformation.hh. Definition at line 230 of file QweakSimUserInformation.hh. Definition at line 233 of file QweakSimUserInformation.hh. Definition at line 236 of file QweakSimUserInformation.hh. Definition at line 242 of file QweakSimUserInformation.hh. Definition at line 221 of file QweakSimUserInformation.hh. Definition at line 224 of file QweakSimUserInformation.hh. Definition at line 227 of file QweakSimUserInformation.hh. Definition at line 239 of file QweakSimUserInformation.hh. Definition at line 252 of file QweakSimUserInformation.hh. Definition at line 377 of file QweakSimUserInformation.hh. Definition at line 246 of file QweakSimUserInformation.hh. Definition at line 328 of file QweakSimUserInformation.hh. Referenced by QweakSimPrimaryGeneratorAction::ResetNtupleEventCounter(), and QweakSimPrimaryGeneratorAction::SetNtupleEventCounter(). Definition at line 316 of file QweakSimUserInformation.hh. Definition at line 371 of file QweakSimUserInformation.hh. Definition at line 374 of file QweakSimUserInformation.hh. Definition at line 393 of file QweakSimUserInformation.hh. Referenced by Initialize(), and QweakSimSteppingAction::UserSteppingAction(). Definition at line 212 of file QweakSimUserInformation.hh. Definition at line 133 of file QweakSimUserInformation.hh. Referenced by GetAsymmetry(), Initialize(), and StoreAsymmetry(). Definition at line 167 of file QweakSimUserInformation.hh. Referenced by AddCerenkovEnergyDeposit(), GetCerenkovEnergyDeposit(), and Initialize(). Definition at line 188 of file QweakSimUserInformation.hh. Referenced by GetLocalCerenkovExitPosition(), Initialize(), and StoreLocalCerenkovExitPosition(). Definition at line 182 of file QweakSimUserInformation.hh. Referenced by GetCerenkovOpticalPhotonCount(), IncrementCerenkovOpticalPhotonCount(), Initialize(), and ResetCerenkovSecondaryParticleInfo(). Definition at line 194 of file QweakSimUserInformation.hh. Referenced by GetCerenkovPhotonEnergyAtIndex(), Initialize(), ResetCerenkovSecondaryParticleInfo(), and StoreCerenkovPhotonEnergy(). Definition at line 179 of file QweakSimUserInformation.hh. Referenced by GetCerenkovSecondaryElectronCount(), Initialize(), ResetCerenkovSecondaryParticleInfo(), and StoreCerenkovSecondaryParticleInfo(). Definition at line 192 of file QweakSimUserInformation.hh. Referenced by GetCerenkovSecondaryParticleCharge(), Initialize(), ResetCerenkovSecondaryParticleInfo(), and StoreCerenkovSecondaryParticleInfo(). Definition at line 191 of file QweakSimUserInformation.hh. Referenced by GetCerenkovSecondaryParticleEnergy(), Initialize(), ResetCerenkovSecondaryParticleInfo(), and StoreCerenkovSecondaryParticleInfo(). Definition at line 178 of file QweakSimUserInformation.hh. Referenced by GetCerenkovSecondaryParticleCharge(), GetCerenkovSecondaryParticleCount(), GetCerenkovSecondaryParticleEnergy(), GetCerenkovSecondaryParticleMomentum(), GetCerenkovSecondaryParticleOrigin(), Initialize(), QweakSimUserInformation(), ResetCerenkovSecondaryParticleInfo(), and StoreCerenkovSecondaryParticleInfo(). Definition at line 190 of file QweakSimUserInformation.hh. Referenced by GetCerenkovSecondaryParticleMomentum(), Initialize(), ResetCerenkovSecondaryParticleInfo(), and StoreCerenkovSecondaryParticleInfo(). Definition at line 189 of file QweakSimUserInformation.hh. Referenced by GetCerenkovSecondaryParticleOrigin(), Initialize(), ResetCerenkovSecondaryParticleInfo(), and StoreCerenkovSecondaryParticleInfo(). Definition at line 180 of file QweakSimUserInformation.hh. Referenced by GetCerenkovSecondaryPhotonCount(), Initialize(), ResetCerenkovSecondaryParticleInfo(), and StoreCerenkovSecondaryParticleInfo(). Definition at line 181 of file QweakSimUserInformation.hh. Referenced by GetCerenkovSecondaryPositronCount(), Initialize(), ResetCerenkovSecondaryParticleInfo(), and StoreCerenkovSecondaryParticleInfo(). Definition at line 119 of file QweakSimUserInformation.hh. Referenced by GetCrossSection(), Initialize(), and StoreCrossSection(). Definition at line 122 of file QweakSimUserInformation.hh. Referenced by GetCrossSectionBornInelastic(), Initialize(), and StoreCrossSectionBornInelastic(). Definition at line 123 of file QweakSimUserInformation.hh. Referenced by GetCrossSectionBornQE(), Initialize(), and StoreCrossSectionBornQE(). Definition at line 121 of file QweakSimUserInformation.hh. Referenced by GetCrossSectionBornTotal(), Initialize(), and StoreCrossSectionBornTotal(). Definition at line 127 of file QweakSimUserInformation.hh. Referenced by GetCrossSectionRadDIS(), Initialize(), and StoreCrossSectionRadDIS(). Definition at line 131 of file QweakSimUserInformation.hh. Referenced by GetCrossSectionRadDISIntOnly(), Initialize(), and StoreCrossSectionRadDISIntOnly(). Definition at line 125 of file QweakSimUserInformation.hh. Referenced by GetCrossSectionRadElastic(), Initialize(), and StoreCrossSectionRadElastic(). Definition at line 129 of file QweakSimUserInformation.hh. Referenced by GetCrossSectionRadElasticIntOnly(), Initialize(), and StoreCrossSectionRadElasticIntOnly(). Definition at line 132 of file QweakSimUserInformation.hh. Referenced by GetCrossSectionRadElasticPeak(), Initialize(), and StoreCrossSectionRadElasticPeak(). Definition at line 126 of file QweakSimUserInformation.hh. Referenced by GetCrossSectionRadQE(), Initialize(), and StoreCrossSectionRadQE(). Definition at line 130 of file QweakSimUserInformation.hh. Referenced by GetCrossSectionRadQEIntOnly(), Initialize(), and StoreCrossSectionRadQEIntOnly(). Definition at line 124 of file QweakSimUserInformation.hh. Referenced by GetCrossSectionRadTotal(), Initialize(), and StoreCrossSectionRadTotal(). Definition at line 128 of file QweakSimUserInformation.hh. Referenced by GetCrossSectionRadTotalIntOnly(), Initialize(), and StoreCrossSectionRadTotalIntOnly(). Definition at line 120 of file QweakSimUserInformation.hh. Referenced by GetCrossSectionWeight(), Initialize(), and StoreCrossSectionWeight(). Definition at line 171 of file QweakSimUserInformation.hh. Referenced by AddTodEBremIn(), ClearELoss(), GetdEBremIn(), GetdEBremTot(), GetdETot(), GetdETotIn(), PrintELoss(), and StoredEBremIn(). Referenced by AddTodEBremOut(), ClearELoss(), GetdEBremOut(), GetdEBremTot(), GetdETot(), GetdETotOut(), PrintELoss(), and StoredEBremOut(). Definition at line 170 of file QweakSimUserInformation.hh. Referenced by AddTodEIonIn(), ClearELoss(), GetdEIonIn(), GetdEIonTot(), GetdETot(), GetdETotIn(), PrintELoss(), and StoredEIonIn(). Referenced by AddTodEIonOut(), ClearELoss(), GetdEIonOut(), GetdEIonTot(), GetdETot(), GetdETotOut(), PrintELoss(), and StoredEIonOut(). Definition at line 172 of file QweakSimUserInformation.hh. Referenced by AddTodEMscIn(), ClearELoss(), GetdEMscIn(), GetdEMscTot(), GetdETot(), GetdETotIn(), PrintELoss(), and StoredEMscIn(). Referenced by AddTodEMscOut(), ClearELoss(), GetdEMscOut(), GetdEMscTot(), GetdETot(), GetdETotOut(), PrintELoss(), and StoredEMscOut(). Definition at line 174 of file QweakSimUserInformation.hh. Referenced by GetEdgeEventDetected(), and SetEdgeEventDetected(). Definition at line 163 of file QweakSimUserInformation.hh. Referenced by GetEffectiveKinematicNu(), Initialize(), and StoreEffectiveKinematicNu(). Definition at line 162 of file QweakSimUserInformation.hh. Referenced by GetEffectiveKinematicQ2(), Initialize(), and StoreEffectiveKinematicQ2(). Definition at line 165 of file QweakSimUserInformation.hh. Referenced by GetEffectiveKinematicW(), Initialize(), and StoreEffectiveKinematicW(). Definition at line 164 of file QweakSimUserInformation.hh. Referenced by GetEffectiveKinematicX(), Initialize(), and StoreEffectiveKinematicX(). Definition at line 201 of file QweakSimUserInformation.hh. Referenced by GetEPEvent(), and SetEPEvent(). Definition at line 70 of file QweakSimUserInformation.hh. Definition at line 157 of file QweakSimUserInformation.hh. Referenced by GetBeamEnergy(), Initialize(), and SetBeamEnergy(). Definition at line 158 of file QweakSimUserInformation.hh. Referenced by GetEPrime(), and SetEPrime(). Definition at line 155 of file QweakSimUserInformation.hh. Referenced by GetEPrime_Max(), Initialize(), and SetEPrime_Max(). Definition at line 154 of file QweakSimUserInformation.hh. Referenced by GetEPrime_Min(), Initialize(), and SetEPrime_Min(). Definition at line 159 of file QweakSimUserInformation.hh. Referenced by GetLuminosity(), Initialize(), and SetLuminosity(). Definition at line 111 of file QweakSimUserInformation.hh. Referenced by GetNormMomentum(), GetNormMomentumX(), Initialize(), Print(), and SetBeamDirectionX(). Definition at line 112 of file QweakSimUserInformation.hh. Referenced by GetNormMomentum(), GetNormMomentumY(), Initialize(), Print(), and SetBeamDirectionY(). Definition at line 106 of file QweakSimUserInformation.hh. Referenced by GetNumberOfEventToBeProcessed(), and SetNumberOfEventToBeProcessed(). Definition at line 160 of file QweakSimUserInformation.hh. Referenced by GetPhaseSpace(), Initialize(), and SetPhaseSpace(). Definition at line 151 of file QweakSimUserInformation.hh. Referenced by GetPhiAngle_Max(), Initialize(), and SetPhiAngle_Max(). Definition at line 150 of file QweakSimUserInformation.hh. Referenced by GetPhiAngle_Min(), Initialize(), and SetPhiAngle_Min(). Definition at line 108 of file QweakSimUserInformation.hh. Referenced by GetBeamPositionX(), Initialize(), Print(), and SetBeamPositionX(). Definition at line 109 of file QweakSimUserInformation.hh. Referenced by GetBeamPositionY(), Initialize(), Print(), and SetBeamPositionY(). Definition at line 110 of file QweakSimUserInformation.hh. Referenced by GetBeamPositionZ(), and SetBeamPositionZ(). Definition at line 153 of file QweakSimUserInformation.hh. Referenced by GetThetaAngle_Max(), Initialize(), and SetThetaAngle_Max(). Definition at line 152 of file QweakSimUserInformation.hh. Referenced by GetThetaAngle_Min(), Initialize(), and SetThetaAngle_Min(). Definition at line 117 of file QweakSimUserInformation.hh. Referenced by GetGlobalTime(), Initialize(), and StoreGlobalTime(). Definition at line 175 of file QweakSimUserInformation.hh. Referenced by GetLeftPMTHitValid(), Initialize(), and SetLeftPMTHitValid(). Definition at line 146 of file QweakSimUserInformation.hh. Referenced by GetOriginVertexKinematicNu(), Initialize(), and StoreOriginVertexKinematicNu(). Definition at line 145 of file QweakSimUserInformation.hh. Referenced by GetOriginVertexKinematicQ2(), Initialize(), and StoreOriginVertexKinematicQ2(). Definition at line 148 of file QweakSimUserInformation.hh. Referenced by GetOriginVertexKinematicW(), Initialize(), and StoreOriginVertexKinematicW(). Definition at line 147 of file QweakSimUserInformation.hh. Referenced by GetOriginVertexKinematicX(), Initialize(), and StoreOriginVertexKinematicX(). Definition at line 143 of file QweakSimUserInformation.hh. Referenced by GetOriginVertexKineticEnergy(), Initialize(), Print(), and StoreOriginVertexKineticEnergy(). Definition at line 139 of file QweakSimUserInformation.hh. Referenced by GetOriginVertexMomentumDirectionX(), Initialize(), Print(), and StoreOriginVertexMomentumDirectionX(). Definition at line 140 of file QweakSimUserInformation.hh. Referenced by GetOriginVertexMomentumDirectionY(), Initialize(), Print(), and StoreOriginVertexMomentumDirectionY(). Definition at line 141 of file QweakSimUserInformation.hh. Referenced by GetOriginVertexMomentumDirectionZ(), Initialize(), Print(), and StoreOriginVertexMomentumDirectionZ(). Definition at line 138 of file QweakSimUserInformation.hh. Referenced by GetOriginVertexPhiAngle(), Initialize(), Print(), and StoreOriginVertexPhiAngle(). Definition at line 134 of file QweakSimUserInformation.hh. Referenced by GetOriginVertexPositionX(), Initialize(), Print(), and StoreOriginVertexPositionX(). Definition at line 135 of file QweakSimUserInformation.hh. Referenced by GetOriginVertexPositionY(), Initialize(), Print(), and StoreOriginVertexPositionY(). Definition at line 136 of file QweakSimUserInformation.hh. Referenced by GetOriginVertexPositionZ(), Initialize(), Print(), and StoreOriginVertexPositionZ(). Definition at line 137 of file QweakSimUserInformation.hh. Referenced by GetOriginVertexThetaAngle(), Initialize(), Print(), and StoreOriginVertexThetaAngle(). Definition at line 144 of file QweakSimUserInformation.hh. Referenced by GetOriginVertexTotalEnergy(), Initialize(), Print(), and StoreOriginVertexTotalEnergy(). Definition at line 115 of file QweakSimUserInformation.hh. Referenced by GetPDGcode(), Initialize(), and StorePDGcode(). Definition at line 196 of file QweakSimUserInformation.hh. Referenced by GetCurrentPMTHit(), and SetCurrentPMTHit(). Definition at line 184 of file QweakSimUserInformation.hh. Referenced by GetNumberOfPhotoelectrons(), and Initialize(). Definition at line 185 of file QweakSimUserInformation.hh. Referenced by GetNumberOfPhotoelectronsS20(), and Initialize(). Definition at line 198 of file QweakSimUserInformation.hh. Referenced by GetCurrentPMTSide(), and SetCurrentPMTHit(). Definition at line 142 of file QweakSimUserInformation.hh. Referenced by GetPreScatteringKineticEnergy(), and StorePreScatteringKineticEnergy(). Definition at line 114 of file QweakSimUserInformation.hh. Referenced by GetPrimaryEventNumber(), Initialize(), Print(), and StorePrimaryEventNumber(). Definition at line 118 of file QweakSimUserInformation.hh. Referenced by GetPrimaryQ2(), Initialize(), and StorePrimaryQ2(). Definition at line 69 of file QweakSimUserInformation.hh. Referenced by GetReactionRegion(), Initialize(), and StoreReactionRegion(). Definition at line 68 of file QweakSimUserInformation.hh. Referenced by GetReactionType(), Initialize(), Print(), and StoreReactionType(). Definition at line 176 of file QweakSimUserInformation.hh. Referenced by GetRightPMTHitValid(), Initialize(), and SetRightPMTHitValid(). Definition at line 187 of file QweakSimUserInformation.hh. Referenced by GetStoredStepVolumeName(), and StoreStepVolumeName(). Definition at line 26 of file QweakSimUserInformation.hh. Referenced by QweakSimDetectorConstruction::ConstructQweak(), Initialize(), QweakSimEPEvent::Pion_PhotoProduction(), QweakSimEPEvent::Pion_PhotoProductionCarbon(), Print(), QweakSimSteppingAction::QweakSimSteppingAction(), QweakSimTarget::QweakSimTarget(), and QweakSimTarget::SetTargetCenterPositionInZ(). Definition at line 32 of file QweakSimUserInformation.hh. Definition at line 28 of file QweakSimUserInformation.hh. Referenced by QweakSimEPEvent::Pion_PhotoProduction(), QweakSimEPEvent::Pion_PhotoProductionAl(), QweakSimEPEvent::Pion_PhotoProductionCarbon(), QweakSimTarget::QweakSimTarget(), and QweakSimTarget::SetTargetEntranceWindowLength(). Definition at line 30 of file QweakSimUserInformation.hh. Referenced by QweakSimEPEvent::Pion_PhotoProductionAl(), QweakSimTarget::QweakSimTarget(), and QweakSimTarget::SetTargetExitWindowNippleLength(). Definition at line 29 of file QweakSimUserInformation.hh. Referenced by QweakSimTarget::QweakSimTarget(), and QweakSimTarget::SetTargetExitWindowLength(). Definition at line 27 of file QweakSimUserInformation.hh. Referenced by Initialize(), QweakSimEPEvent::Pion_PhotoProduction(), QweakSimEPEvent::Pion_PhotoProductionAl(), QweakSimEPEvent::Pion_PhotoProductionCarbon(), Print(), QweakSimTarget::QweakSimTarget(), and QweakSimTarget::SetTargetLength(). Definition at line 50 of file QweakSimUserInformation.hh. Definition at line 51 of file QweakSimUserInformation.hh. Definition at line 58 of file QweakSimUserInformation.hh. Definition at line 62 of file QweakSimUserInformation.hh. Definition at line 61 of file QweakSimUserInformation.hh. Definition at line 63 of file QweakSimUserInformation.hh. Definition at line 60 of file QweakSimUserInformation.hh. Definition at line 65 of file QweakSimUserInformation.hh. Definition at line 64 of file QweakSimUserInformation.hh. Definition at line 66 of file QweakSimUserInformation.hh. Definition at line 59 of file QweakSimUserInformation.hh. Definition at line 52 of file QweakSimUserInformation.hh. Definition at line 46 of file QweakSimUserInformation.hh. Definition at line 54 of file QweakSimUserInformation.hh. Definition at line 44 of file QweakSimUserInformation.hh. Definition at line 47 of file QweakSimUserInformation.hh. Definition at line 48 of file QweakSimUserInformation.hh. Definition at line 49 of file QweakSimUserInformation.hh. Definition at line 45 of file QweakSimUserInformation.hh. Definition at line 53 of file QweakSimUserInformation.hh. Definition at line 38 of file QweakSimUserInformation.hh. Referenced by QweakSimTarget::QweakSimTarget(), and QweakSimTarget::SetTarget(). Definition at line 39 of file QweakSimUserInformation.hh. Referenced by QweakSimEPEvent::Pion_PhotoProductionAl(), QweakSimTarget::QweakSimTarget(), and QweakSimTarget::SetTarget(). Definition at line 40 of file QweakSimUserInformation.hh. Definition at line 42 of file QweakSimUserInformation.hh. Definition at line 35 of file QweakSimUserInformation.hh. Definition at line 36 of file QweakSimUserInformation.hh. Definition at line 37 of file QweakSimUserInformation.hh. Definition at line 41 of file QweakSimUserInformation.hh. Definition at line 31 of file QweakSimUserInformation.hh. Definition at line 116 of file QweakSimUserInformation.hh. Referenced by GetTrackID(), Initialize(), and StoreTrackID().